July 17 is traditionally the feast of the holy, humble confessor Saint Alexius. According to the most recent researches he was an Eastern saint whose veneration was transplanted from the Byzantine empire to Rome, whence it spread rapidly throughout western Christendom. Together with the name and veneration of the Saint, his legend was made known to Rome and the West by means of Latin versions and recensions based on the form current in the Byzantine Orient. This process was facilitated by the fact that according to the earlier Syriac legend of the Saint, the “Man of God,” of Edessa (identical with St. Alexius) was a native of Rome. The Greek legend, which antedates the ninth century and is the basis of all later versions, makes Alexius the son of a distinguished Roman named Euphemianus. The night of his marriage he secretly left his father’s house and journeyed to Edessa in the Syrian Orient where, for seventeen years, he led the life of a pious ascetic. As the fame of his sanctity grew, he left Edessa and returned to Rome, where, for seventeen years, he dwelt as a beggar under the stairs of his father’s palace, unknown to his father or wife. After his death, assigned to the year 417, a document was found on his body, in which he revealed his identity. He was forthwith honored as a saint and his father’s house was converted into a church placed under the patronage of Alexius. In this expanded form the legend is first found in a hymn (canon) of the Greek hymnographer Josephus (d. 883). It also occurs in a Syrian biography of Alexius, written not later than the ninth century, and which presupposes the existence of a Greek life of the Saint. The latter is in turn based on an earlier Syriac legend (referred to above), composed at Edessa between 450 and 475. Although in this latter document the name of Alexius is not mentioned, he is manifestly the same as the “Man of God” of whom this earlier Syriac legend relates that he lived in Edessa during the episcopate of Bishop Rabula (412-435) as a poor beggar, and solicited alms at the church door. These he divided among the rest of the poor, after reserving barely enough for the absolute necessities of life. He died in the hospital and was buried in the common grave of the poor. Before his death, however, he revealed to one of the church servants that he was the only son of distinguished Roman parents. After the Saint’s death, the servant told this to the Bishop. Thereupon the grave was opened, but only his pauper’s rags were now found therein. How far this account is based on historical tradition is hard to determine. Perhaps the only basis for the story is the fact that a certain pious ascetic at Edessa lived the life of a beggar and was later venerated as a saint. In addition to this earlier Syriac legend, the Greek author of the later biography of St. Alexius, which we have mentioned above as having been written before the ninth century, probably had in mind also the events related in the life of St. John Calybata, a young Roman patrician, concerning whom a similar story is told. In the West we find no trace of the name Alexius in any martyrology or other liturgical book previous to the end of the tenth century; he seems to have been completely unknown. He first appears in connection with St. Boniface as titular saint of a church on the Aventine at Rome. On the site now occupied by the church of Sant’ Alessio there was at one time a diaconia, i.e. an establishment for the care of the poor of the Roman Church. Connected with this was a church which by the eighth century had been in existence for some time and was dedicated to St. Boniface. In 972 Pope Benedict VII transferred the almost abandoned church to the exiled Greek metropolitan, Sergius of Damascus. The latter erected beside the church a monastery for Greek and Latin monks, soon made famous for the austere life of its inmates. To the name of St. Boniface was now added that of St. Alexius as titular saint of the church and monastery. It is evidently Sergius and his monks who brought to Rome the veneration of St. Alexius. The Oriental Saint, according to his legend a native of Rome, was soon very popular with the folk of that city. Among the frescoes executed towards the end of the eleventh century in the Roman basilica of St. Clement (now the lower church of San Clemente) are very interesting representations of events in the life of St. Alexius. His feast is observed on the 17th of July, in the West; in the East, on the 17th of March. The church of Sts. Alexius and Boniface on the Aventine has been renovated in modern times but several medieval monuments are still preserved there. 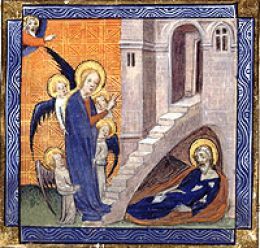 Among them the visitor is shown the alleged stairs of the house of Euphemianus under which Alexius is said to have lived. May the intercession of the blessed Alexius, we beseech Thee, O Lord, commend us unto Thee, that what we can not hae through our own merits, we may obtain through his patronage. Through our Lord Jesus Christ, Thy Son, Who liveth and reigneth with Thee in the unity of the Holy Ghost, God, Forever and ever. Lesson from the Epistle of blessed Paul, the Apostle to Timothy. Dearly beloved: Godliness with contentment is great gain. For we brought nothing into this world, and certainly we can carry nothing out. But having food, and wherewith to be covered, with these we are content. For they that will become rich, fall into temptation, and into the snare of the devil, and into many unprofitable and hurtful desires, which drown men in destruction and perdition. For covetousness is the root of all evils; which some desiring have erred from the Faith and have entangled themselves in many sorrows. But thou, O man of God, fly these things; and pursue justice, godliness, faith, charity, patience, meekness. Fight the good fight of faith; Iay hold on eternal life. The just shall flourish like the palm tree: he shall grow up like the cedar of Lebanon in the house of the Lord. V. (Psalm 61: 3) To show forth Thy mercy in the morning, and Thy truth in the night. Alleluia. Alleluia. Blessed is the man that endureth temptation: for when he hath been proved, he shall receive the crown of life. Alleluia. Thou hast given him his hearts desire, O Lord, and hast not withholden from him the will of his lips: Thou hast set on his head a crown of precious stones. May Thy holy confessor we beseech Thee, O Lord, obtain for us that the victims placed upon Thy holy altar may avail us unto salvation. Through our Lord Jesus Christ Thy Son our Lord, Who liveth and reigneth with Thee in the unity of the Holy Ghost, one God Forever and ever. The faithful and wise servant, whom his lord setteth over his family, to give them their measure of wheat in due season. May the reception of Thy sacrament, and the intercession of blessed Alexius, protect us, O Lord; that we may put into practice the virtues of his life, and receive the help of his intercession. Through the Lord Jesus Christ, Thy Son, Who liveth and reigneth with Thee in the unity of the Holy Ghost, one God For ever and ever.